On its own, the new interface is just the frivolous front-end to an upgrade of the Windows 7 operating system. What makes the Windows 8 Metro-style interface compulsive are the hundreds of Apps produced by scores of developers; as a result there will be little programs to suit every interest. The combination of the Metro-style design and the clever tiled applets will soon hook you onto this new way of interacting with computer information. Once Windows 8 initializes and you logon, what you see is a new Start screen with a montage of icons, which are now called tiles. This is a radical development, which replaces the Windows shortcuts of previous Microsoft desktops, with information-rich Apps. If you swipe the screen from right to left an overlay appears which enables you to select an App. 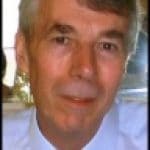 Although the technique is fluid and intuitive, it requires us to replace the old click and scroll mind-set, with a hand-grab technique. However, you can bring the scroll-wheel into play, for example, flicking through the start screen tiles. While this new Metro display layout is ideal for tablets, the tiles have been designed to work on bigger screens because they respond to a mouse click almost as easily as a finger. Indeed, this format is scalable from an 8-inch screen all the way up to wall-displays. A back-handed compliment is that users complain that the Metro UI is just like a tablet, but with Windows. Another feature for tablets is adaptive brightness. This is a classic example of hardware and software developing in tandem. Tablet screens can change their brightness based on light conditions. Windows 8 provides the software to sense and change automatically. The biggest news in Windows 8 is the disappearance of the Start Orb. For those who bemoan this loss I say: ‘Think of the whole Metro UI as one massive start button’. Voila! there are your icons; and if you want to ‘Search’ – just start typing! See more on the Windows 8 desktop v metro-UI debate. A program’s tile has more space than the corresponding icon, thus it can display up-to-date information, for example the latest weather, or a traffic report. Furthermore, each tile is ‘chromeless’ thus the program can use the whole screen since there is no need for scroll-bars. 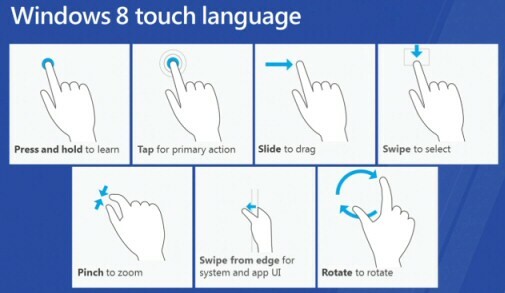 You manipulate the Windows 8 controls from the sides with your thumbs, while you can swipe the application’s own controls from the top and bottom with your fore-finger. The golden rule is that all Apps controls have the same look and feel. When users switch from Windows 7 they need to change their mind-sets and think of flicking through a grid of tiles, and not be worrying about, ‘Where’s my shortcut gone?’ Those who are used to Smart Phones will find it easy to abandon thoughts of the old Taskbar and Desktop and begin to thumb through the Metro UI’s mosaic of tiled Apps. Opinion is divided whether users can indeed switch from ‘touch first’ Windows 8 at home to the traditional Windows 7 in the workplace. For these people, one way of looking at the old style desktop is as just another app which you can launch from Metro UI. One surprise with the Metro UI is the way that you can semantically zoom the icons. A pleasant side-effect is that you can name the columns. Hover the mouse over the bottom right corner so that a tiny magnifier with four icons appears. Right-click one of the groups of icons (key point). ‘Name group’ should appear at the bottom left, see screenshot. 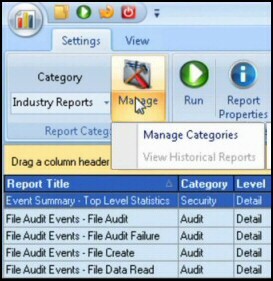 Click on Name group; in the dialog box type your choice of title. Press WinKey to return to the Metro UI and see your name. See more on how to name a Metro group of tiles. I supported Vista users who wanted to revert to XP’s Quick Launch, and I still hanker back to the days when you could customise the Office Ribbon / Toolbar easily. But with the Metro UI -v- Windows 7 interface debate there’s no contest, the intelligent touch orientated tiles are the way to go. Still, people are being polarized; on the one hand there are those with a touch screen, and an interest in the many apps, who love Windows 8. On the other hand, there are Luddites with an old monitor, an inflexible mind-set and only business applications. 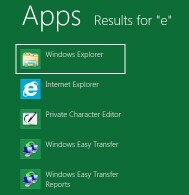 If you gave them Windows 8 they would seek ways of reverting to the traditional Windows 7 style start menu. To recap: the top and bottom of the screen are for the Apps controls, while the sides are consistently for the system buttons such as the 5 ‘Charms’. Search, Share, Start, Devices and Settings, (See screenshot to the left). Interestingly, people always use two hands for tablet. That’s why App Bar controls are at the sides where you would place your thumb. Where ever possible apps are designed to work with a mouse click just as they operate with finger touch. Incidentally, if you get stuck with the mouse, right-click is your contextual saviour. The new UI began with Microsoft's mobile operating system Windows Phone 7. A specially made version of Microsoft’s Segoe font family, Segoe WP, is used as the main font family for all typographical elements of the new UI. Pinch to zoom. Semantic view, icons change depending on resolution. Windows Run Time (WinRT), this is the environment for tailored Metro UI apps that launch from the Windows 8 Start screen. In fact this is a replacement for Win32, thus WinRT is important because it’s the new native runtime in Windows 8. The real benefit of WinRT is that the apps are sandboxed so that they cannot interfere with other programs. If you right-click an App you can ‘Pin’ or ‘Unpin’ to the Metro UI. It’s not long before you start dragging the Tiles around, grouping them and moving the most important to the left. Metro manipulation techniques also extend to IE 10, where the browser is optimised for touch, and panning. See more on Windows 8 IE 10. 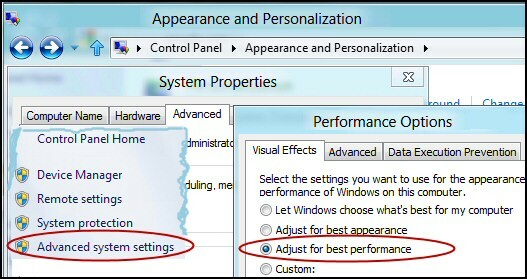 Set the radio button to adjust to best performance. Buying a New Screen for Windows 8? To get the most out of Windows 8 Metro you need a TouchSmart monitor capable of wide screen display with a 16 x 9 aspect ratio at 1366 x 768 pixels. Naturally, a 1024 x 768 display will still work, but you will notice the difference. Windows 8 laptops will also have a Kinect motion sensing device. These are like webcams and features on Xboxes. The biggest benefit is that will enable people to interact with Windows 8 without touching the mouse. The original touch screens with pressure-sensitive panels required the user to press down on the screen. Unfortunately, resistive screens could track the position of just one finger at a time. What Apple did was to track two simultaneous touches, thus enabling more versatile commands such as rotate or pinch. Modern touch panels are laid on top of a liquid crystal display. Capacitive touch-sensing technology requires a person’s finger to disturb the electrical field; unlike resistive designs, it doesn’t work with any old object. Samsung has taken the multi-touch technology a stage further by introducing (AMOLED) screens (active-matrix organic light-emitting diode). The key feature is sensors directly on the screen itself, which allows a thinner display than the original Apple layered design. The new 7″ tab from T-Mobile is built by Samsung and is their most recent product with the AMOLED screen. For those who like big desktop machines you can still operate Windows 8 controls with the mouse. It seems to me that after the initial novelty of scrolling with my fingers the novelty would wear off. Furthermore I have developed a fetish for a clean screen and all those greasy finger prints would drive me mad. My strategy will be to keep my desktop for keyboard intensive work, and buy a cheap ARM tablet to play with the Apps. Winrumours are full of articles discussing Windows 8 developments. In Windows 8 the user interface has undergone a revolutionary change. Under the covers, the Windows 8 kernel is just a better version of Windows 7, but the new UI design is a revolutionary change from the Aero desktop. The switch to tiles brings with it a new mind-set, instead of scrolling through windows you grab tiles and swizzle them into position; a technique that Smartphone users will already have mastered. In another clever piece of programming the app on the tile is dynamic and thus capable of live update notifications.